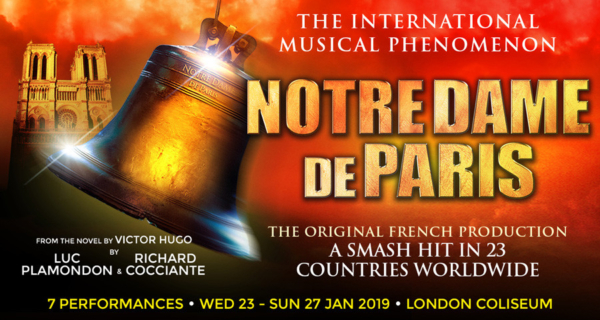 Twenty years after its Parisian debut, the French musical Notre Dame de Paris is to perform in London, after receiving international acclaim in 23 countries worldwide. 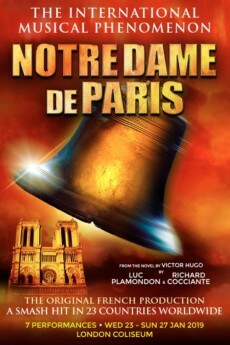 Based upon the 1831 novel Notre-Dame de Paris by Victor Hugo, Notre Dame de Paris will feature an international ensemble of singers, dancers and acrobats to tell the tale of the hunchbacked cathedral bell-ringer, Quasimodo, and his tragic love for the gypsy, Esmeralda. The original French production in London will be performed with English surtitles and a live orchestra. Having sold out performances across 16 countries and been translated into nine different languages, Notre Dame de Paris originally debuted at the Palais des Congrès in Paris, 1998. Following its opening, the production was commended in the Guinness Book of World Records 2000 for its record success for a musical during its first year. The music is composed by Richard Cocciante, with lyrics by Luc Plamondon. Victor Marie Hugo (1802-1885) was a French poet, novelist, and dramatist of the Romantic movement and is considered one of the greatest French writers. Hugo’s best-known works are the novels Les Misérables, 1862, and Notre-Dame de Paris, 1831, both of which have had several adaptations for stage and screen.